Rhythms of the Brain - Jon Lieff, M.D. The subject of electrical brain rhythms is very important and very confusing. Since scientists cannot yet measure the oscillations of individual neurons without implanted electrodes, they measure the composite oscillations of millions or billions of oscillating cells. 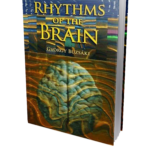 For years partially successful attempts have made to associate specific rhythms like alpha, beta, gamma, and theta, to specific mental and brain functions. This book, written by a leading neuroscientist in the field of brain oscillations, is brilliant, and extremely well written. It offers a comprehensive view of the latest science of brain oscillations in the cortex, a history of the field, and the best wide ranging analysis of how the rhythms might relate to aspects of consciousness. The author has a deep awareness of the broader philosophical and scientific issues involved in this subject.